Compatible amps include Fender® Blues Jr., Deluxe 90, Princeton 65, Stage Series, Acoustasonic Junior, Vaporizer, Ultimate Chorus, Ultra Chorus, Sidekick Keyboard 60, Sidekick Reverb 35, Super 60, Super 112, Frontman 65R, Eighty-Five, Tech 21® Trademark 30, Epiphone® Valve Junior Hot Rod, Vox® AC15CC, AC15C, Ultra 60/120, Backstage, Valveking, plus others. According to our resources you need a 4EB2C1B. If your amp has a short tank, this is most likely the correct tank. You will need to contact Peavey direct to verify that information. Hi, by doing a quick internet search it seems that the 4EB2C1B was used in the Peavey Bandit 65. This is a long tank 2 spring reverb. Since they both have the same input and output impedance (EB) this should work. the input and output impedance are slightly different. Will this still be safe and sound ok? thx! 2 answers Is this the correct tank for a Fender FM65R amplifier ? According to our resources you need a 8DB2C1B. You may want to confirm this with your original tank. 2 answers Is this the right replacement for my 1985 Peavey Backstage Chorus? We know that these work on some of the backstage amps but we are not 100% certain on the Backstage Chorus. 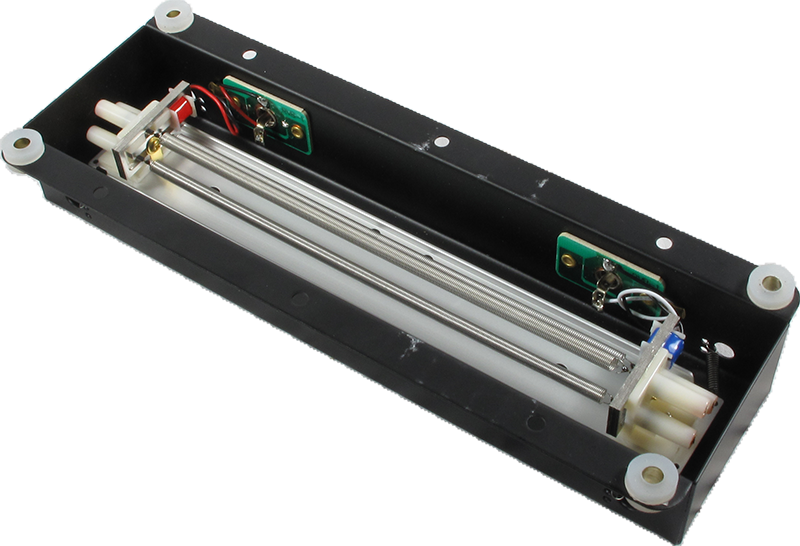 Please email us at info@amplifiedparts.com so we can help you find the correct reverb tank. Will this work on a Crate V20 (2110R) ? 1 answers Reverb tank for fender 25R? We don't offer technical support and as such we wouldn't have the reference materials necessary to determine the proper tank based on Fender's model or part number. However, we can try and help you find a replacement if you can provide some information about your existing unit. Always pay close attention to the series of letters and numbers associated with each reverb tank. In this case 8EB2C1B If these numbers match your existing tank then this replacement will be compatible. Please refer to our tech corner article explaining reverb tanks for a full explanation of what these numbers signify in terms of determining compatibility with your amp. 1 answers Reverb tank for a Peavey Classic 50? 1 answers What is the best medium decay reverb tank for the Hot Rod Deville (4x10)? The stock tank is dead and it was very limited when it was alive. A 4EB3C1B is what the Hot Rod Deville ships with stock. This is a two spring reverb tank with a long decay. For a medium decay look for a 4EB2C1B. 1 answers Can I swap out the stock Accutronics amc2bf2 tank in my Monoprice 15 watt tube amp with this one, and are any modifications required? No, these are not compatible and we can not recommend any modifications. 1 answers Will this fit my Peavey Bandit 112? Always pay close attention to the series of letters and numbers associated with each reverb tank. In this case 8EB2C1B. If these numbers match your existing tank then this replacement will be compatible. 1 answers Can this unit be used to replace a 9EB2C1B in a Peavey Nashville 112? Yes, this tank can be used as the most important specs match(input/output impedance,grounding, etc.). The main difference would be that the 8EB2C1B is a shorter tank. 1 answers Can this unit be used to replace the original Peavey MP 400? Always pay close attention to the series of letters and numbers associated with each reverb tank. In this case 8EB2C1B.If these numbers match your existing tank then this replacement will be compatible. Please refer to our tech corner article explaining reverb tanks for a fully detailed explanation of what these numbers signify in terms of determining compatibility with your amp. The proper tank for a Hot Rod Deluxe is a 4EB3C1B. You always want to pay close attention to the Accutronics numbers. For example in the two tanks you are inquiring about the varied numbers may affect performance and compatibility. I would suggest checking out our tech corner article explaining reverb tanks to determine the tank that will best replace the existing unit. I believe the proper tank for the RP series is a 4FB3A1B. You can find this tank by searching the designation number in the search box. I would still suggest further research to back up my findings as we aren't techs. 1 answers Hello! I own a belton reverb tank that came out of my old Vox AC15. It's in great condition. I would like to build a small reverb unit from this. Similar to the Fender Reverb unit, but possibly smaller. What accessories would I need to make this work? It has the RCA style jacks. Thank you! Hi please do a search for The Wave our reverb kit. SKU: K-MOD103. This will give you an idea of what is involved in building a reverb unit. 1 answers Will this be suitable for my peavey Classic 30? 1 answers Hello. Would like to replace the tank in my Vox AC15C1, and I'm wondering what the difference is between the 8EB2C1B 8EB3C1B in this regard. Is either one more suited for the AC15C1? 8EB2C1B has a medium decay and 8EB3C1B has a long decay. 1 answers Hi,will this reverb tank be a direct replacement for my Fender Super 60 guitar amp? I have tried to read the model numbers on my tank and some are too faded. Thank You! Yes this should work with your Fender Super 60 amp. 1 answers I want to replace reverb tank in a Monoprice 15 Watt tube amp.MOD 8EB2C1B Reverb Tank is what I have heard was a good replacement. Do you know if this will work? As far as a straight swap this tank is not compatible with your amp. Some people have modded their amps to allow this tank to work in the Monoprice 15. We are not amp techs and can not advise you on these mods. 1 answers Which 3 spring tanks are compatible for my Peavey Delta Blues 115 amp? Either the 9EB2C1B or 9EB3C1B should work. The first one has a medium decay and the second one has a long decay. 1 answers Can this tank be used in a fender Princeton 112 plus as amp? We simply do not have the resources or reference materials to determine what type of reverb tank will work in your amp. 1 answers Is this suitable for a Fender supersonic22? According to our limited resources the 4AB3C1B is the OEM tank for your amp. 1 answers Can this replace my reverb tank in blues jr tweed lll, if so do I need to replace the reverb pot also? Thanks. This is the replacement tank for the Fender Blues Jr. You do not need to replace your pot unless it is defective. 1 answers I´m looking for a replacement tank for my PRS SE 30 head. Would this model work? We simply do not have the resources or reference materials to determine what type of reverb tank will work in your amp. We suggest doing a physical inspection of the tank currently in the amp for any distinguishable markings. If you are able to find anything, we may be able to help you find the right tank. Send us an email at: sales@amplifiedparts.com. 1 answers Hi, will this work in a Peavey Studio chorus 210? Thank you for your help. We simply do not have the resources or reference materials to determine what type of reverb tank will work in your amp. Are there any makings on your tank? If so we may be able to help you find the right tank. Send us an email at: sales@amplifiedparts.com. 1 answers Is this suitable to be driven by a reverb transformer or is it meant for solid state circuits? This is able to be driven by a reverb transformer and can also be used in solid state circuits, however, the circuit of the amplifier is what dictates what reverb tank is suitable for each application. We are unable to provide technical support. If you require assistance when installing this in your amp, we advise you consult a professional repair tech. 1 answers Will this fit a fender Princeton chorus amp? It does appear that this is the direct replacement for the tank in that amp. 1 answers Which 3 spring reverb tank is a replacement for a Subzero 20R? 1 answers Hello. What reverb tank would I need to replace a model TPSB2EB2C1B, A three spring if possible. Thank you. 1 answers Hi , will this work for a 80s marshall reverb 12?? Thanks for your help. We simply do not have the resources or reference materials to determine what type of reverb tank will work in your amp. Are there any markings on your tank? If so we may be able to help you find the right tank. Send us an email at: sales@amplifiedparts.com. perfect replacement for fender blues jr.
A world of difference! Better, cleaner sound and more control.I can't and imagine a better upgrade for the price. OMG - bought this to replace a stock Spring Reverb in my Fender Blues Jr and what a HUGE difference. The stock one "maybe" sounded ok up until 3 on the dial, after that it was just rubbish. This one you can crank, sounds wonderful and is at an incredible price ! Thank you Amplified Parts ! ! ! This is an awesome replacement for the stock reverb tank in my blues junior. The tone is much better! It's an easy replacement, and the 8EB2C1B is a perfect replacement and a very good price. Great job Amplified Parts! I bought this reverb tank to replace the malfunctioning stock one in my Blues Jr. and what a difference. Night and day. Not only was the stock unreliable, but the sound this replacement tank blows it away. Warm, rich and full sounding and useful even without the reverb level cranked. I could never turn the stock one past 2 or 3 without it sounding silly. It was thin and toylike-sounding. This replacement tank is worth every penny. I just received it yesterday and installed it late last night. I can't wait to use it on my gig tonight. I replaced the original (Accutronics/Belton) reverb tank in my blues junior III with the MOD because the old one was sporadic and finally stopped working. This upgrade made a HUGE difference, no more clanky, popping, harsh, jangly nosies, just nice smooth clean warm sounding reverb. The dial now works from 0-12 where as before it was just about useless past 3. Crank the dial up to 9-10 and there is all the surf sound you'll need. This is an amazing upgrade at a killer price and in my opinion blows the original reverb tank away! Thanks!! I don't think these guys could have shipped this any faster. I would say it has at least a good of build quality at the original in my Fender amp. Probably better! It sounds great. Next time I need a reverb tank, I know where I'm getting it! I too bought this to replace the meh grade reverb in my Peavey Envoy 110, but it's taking a detour in my newly acquired Peavey Classic 50 which had one of the deadest, driest, worn out husk of a reverb tank in it. So now my Classic 50 has a short little reverb tank for an Envoy and ya know what? It sounds darned good! So in the mean time my classic 50 gets the Envoy's reverb til the new right sized one shows up. I'm impressed with this Mod tank. I might order a few speakers to go with it. I ordered this to replace the 2 spring tank in my Peavey Envoy 110 (red stripe - 2003?). It was a big improvement to the original. The replacement was easy, I labelled the input & output cables before I removed them from the old tank (it does make a difference, you don't want to cross them) and just plugged the new tank in. With the money I saved over the Factory replacement part I bought the tolex bag to place it inside the cabinet, this should be attached loosely so the tank can wiggle some, which helps to reduce mechanical vibration from the cabinet. I was very pleased with the excellent product and the fast service/shipping from Amplified Parts. Thanks so much!